Click here to read and listen to the broadcast on KUER (radio). The Bureau of Land Management (BLM) is currently preparing a management plan — known as the Moab Master Leasing Plan — to govern oil, gas and potash leasing and development on approximately 750,000 acres of public lands in eastern Utah. In this report, we detail the important environmental and economic risks of increased potash development and outline strategies for mitigating these risks by adopting responsible zoning decisions, best management practices, and other measures. Definition: Potash is a type of salt used mainly as a fertilizer. 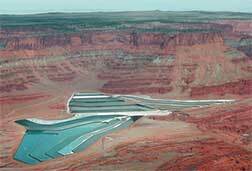 Under its most recent proposed plan, the BLM estimates that each year potash development would require about 2.8 billion gallons of water. These enormous water demands would impose a considerable burden on the Colorado River Basin where existing supplies are already depleted and demand for water is projected to rise. Water availability is not the only problem. Low potash prices and market volatilities make future development risky. Market downturns, which have been frequent for potash, could halt operations and leave behind abandoned facilities and infrastructure. Potash development could also negatively impact existing, stable economic output. Outdoor recreation on public lands around Moab — hiking, biking, rafting, jeeping, sightseeing, to name a few — continue to provide sustainable and durable economic growth to local communities. These critical economic contributors must be protected as the BLM seeks to increase potash development around Moab. While the challenges are many, there are a few concrete steps the BLM can follow to mitigate the impacts of proposed potash development. For starters, because of the water demands and the economic risks involved, BLM should carefully regulate any future potash development on the public lands around Moab. Requiring companies to prove the economic viability of their operations before development is initiated would help ensure proposed developments won’t result in abandoned operations with a myriad of impacts to air, water and the local economy. Also, imposing robust protections for air and water quality during production activities, along with strict reclamation and mitigation requirements would help alleviate some of the environmental risks. These types of “best management practices,” along with others outlined in this report, are critical to any responsible potash development plan for the public lands around Moab.